Our Ukrainian partner Materials Research Centre(MRC) offers manufacturing of Etching Reactor for MXene synthesis. MRC mission is technology development, design and manufacturing of specialized laboratory equipment for different research needs. Our staff includes engineers trained in design, manufacturing, as well as nanotechnology, chemistry, electrochemistry, and materials science. We can help you to develop solutions for your needs within a wide range of materials and equipment for their manufacturing. While most nanomaterials are only available in “nano” quantities, research team of professor Yury Gogotsi in Drexel Nanomaterials Institute, Drexel Universuty (USA) can make in their lab as much as 100 grams of MXene at a time, using a reactor developed with the Materials Research Center in Ukraine. The reactor with controlled feed rate and temperature allows rapid optimization of processing for your specific needs, and our engineering and sales team is always available to answer your questions. Solution for MAX-phase for etching is poured into reactor and hermetically closed by a cover, which enables a controlled and safe removal of hydrogen. MAX-phase feeding is done at a constant rate. To prevent deposition of material, the solution is constantly mixed. Chemical reaction of MAX-phase etching is exothermic. A water-cooled shell and feeder for material supply are designed for the temperature control. Hydrogen that is formed during the etching process flows into the discharge system for further utilization or is discharged. After etching, the solution is discharged for product purification from reaction products and other impurities. 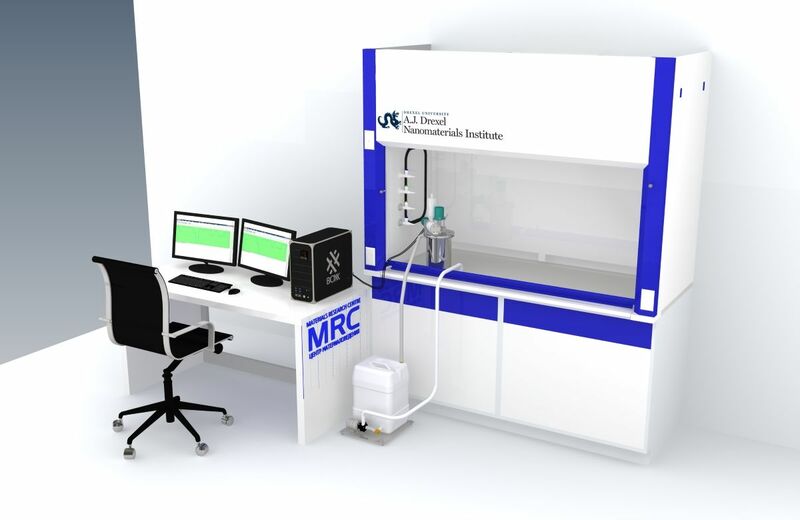 MRC encourage you to learn more about the exciting possibilities we can offer you, and we look forward to partnering with you to improve your material's synthesis and manufacturing.